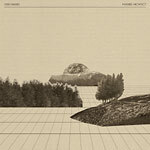 The Invisible Architect is the third full-length album by like minded production duo and long-term friends 1000names. Unlike their previous releases, which focused more on technology and machinery, they drew their inspiration for this album from the unconscious moments that just happen during live shows or studio improvisations, those happy accidents when the music emerges out of the chaos with no traceable origin. In these unconscious moments, it seems, the invisible architect -- a mysterious natural power -- creates this untouched and raw music, almost like the geological formation of rocks in a mountain or the trees in a forest are formed by the fundamental forces of nature.